Three former members of the TWU Spartans volleyball team helped the Canadian team qualify for the Rio 2016 Olympic Games. From left: Dan Jansen Van Doorn, Steven Marshall, Rudy Verhoeff. TWU Spartans photo. 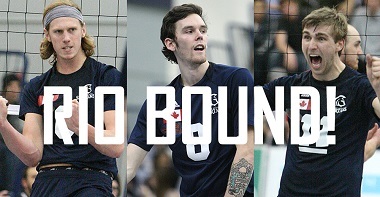 Several former members of the Trinity Western University (TWU) Spartans volleyball team look set to participate in Rio 2016 Olympic Games later this summer. Alumni Steven Marshall, Dan Jansen Van Doorn and Rudy Verhoeff are all members of the Canadian Men’s Volleyball team that took the final berth in the Olympics from China during a hard fought battle in Japan June 5. The team will have its work cut out for it. As part of Pool A, it will face top-ranked Brazil, along with Italy, USA, France and Mexico. The top four sides from each pool will move on to the elimination round. The men’s volleyball tournament runs from August 7 to 21. This is the first time since the 1992 Barcelona Olympics that the Canadian team has qualified for the Games. To see an interview with Jansen Van Doorn, who returned to his home town Langley in June, go here. As if that weren’t enough, former TWU setter Chaim Schalk, with his partner Ben Saxton, has also qualified for the Rio Games, in Beach Volleyball. For a National Post interview with Schalk go here, and to see a brief CBC Sports video go here. The TWU Spartans volleyball program is particularly strong. The Spartans men’s team won the CIS national championship earlier this year, while the women’s team came second nationally. Just after midnight on July 3rd, 2016, a truck full of bombs exploded in front of a busy mall in Karada Baghdad, where hundreds were out shopping and preparing for a Eid they will not be witnessing this year. The toll of martyrs has surpassed 200 and continues to rise, and the scores of wounded over 175. 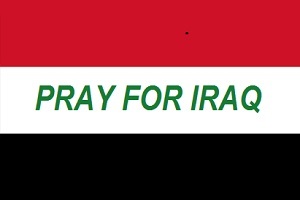 On July 7th, 2016 kindly we ask everyone to come together with their candles and flowers to support one another and to commemorate the innocent lives lost to the horrendous attack in Iraq as well as throughout the globe. 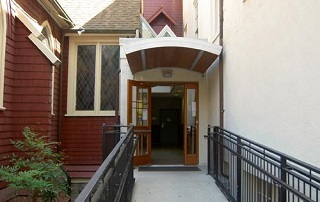 This is the St. Paul’s Advocacy Centre in the West End. We had a senior, Pauline, who came in to see us because the apartment she had lived in for 25 years [in Kitsilano] was undergoing a total renovation and everyone was getting an eviction notice. She visited the St. Paul’s advocacy office on behalf of herself and several other tenants who had lived there for 15 to 30 years. She came to us to confirm a relatively new city bylaw which requires that landlords doing total renovations must abide by strict regulations regarding the number of months notice they must give to tenants. The amount of notice given increases quite substantially for tenants that have lived in one place for a long time. After consulting with one of our tenancy experts it was determined that Pauline was entitled to six months notice as was anyone that had been there for 20 years or more. The landlord had only offered them three months notice. She decided to try along with the other tenants to talk to the landlord on their own; I am glad to report that the landlord was compliant and they all got their six months. Enough time for them to be able to locate suitable housing. This report appeared on the Anglican Diocese of New Westminster website June 28. 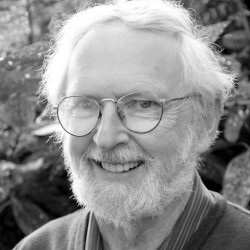 George Marsden has just completed a book on C.S. Lewis’s Mere Christianity for Princeton University Press. On the Mount Rushmore of living American religious historians, four people hold a secure place: Martin Marty, Mark Noll and George Marsden. (Borrowing a line from Marty, I haven’t decided on the fourth one yet.) . . . Marsden has been a mentor through his example of rigorous research, soaring imagination, courage to stand by his convictions and humane collegiality in an academic world not known for an excess of humane collegiality. Thus a lecture by George Marsden on C.S. Lewis is, surely, something not to be missed. As it happens, that is exactly what we will be offered, next Tuesday (July 12) at Regent College, when Marsden addresses The Genius of C.S. Lewis’s Mere Christianity. Since 2001 Mere Christianity has sold over three and a half million copies in English alone. What accounts for the lasting vitality of this volume? This lecture will recount the unusual origins of this remarkable book and reflect on why, in contrast with the vast majority of books, its popularity has increased rather than declined. The lecture will be drawn from professor Marsden’s new study, C.S. Lewis’s Mere Christianity: A Biography (in the Princeton University Press series “The Lives of Great Religious Books”). I certainly hope to be there.